The violin from the band that played as the Titanic sank has been found in an attic in England, a British auction house said on Friday. The rosewood violin was believed to have disappeared beneath the waves when its owner, band leader Wallace Hartley, drowned with some 1,500 others onboard the supposedly "unsinkable" ocean liner in April 1912. 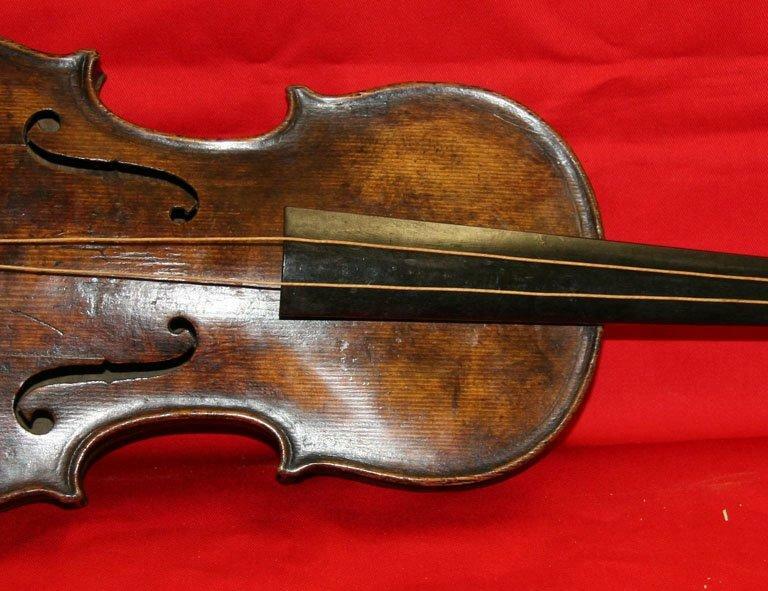 But after seven years of testing, auction house Henry Aldridge and Son said it could confirm that a violin found in an attic in Lancashire, northwest England, was 34-year-old Hartley's. The band played the hymn "Nearer, My God, To Thee" as the Titanic sank beneath the icy North Atlantic after striking an iceberg. Andrew Aldridge of Henry Aldridge and Son, a leading authority on Titanic memorabilia, said there was no doubt the violin was authentic. "The deposit on it and the corrosion on it were compatible with immersion in sea water," Aldridge told AFP. "We also employed a jewellery expert, who confirmed that the inscriptions on the plaque on the violin were contemporary." Hartley was given the violin by his fiancee Maria Robinson to mark their engagement in 1910. She had a silver plaque fixed to the instrument engraved with the words: "For Wallace, on the occasion of our engagement. From Maria." "You can appreciate why he wanted to keep it with him," said Aldridge. Hartley's body was recovered 10 days after the shipwreck, but the violin was not listed among his possessions. It is now thought that the instrument was inside a leather bag that was found strapped to him. A telegram has also emerged from Robinson, thanking Canadian authorities for returning the violin to her. Robinson never married and after her death in 1939, her sister donated the violin to her local Salvation Army band, where it passed into the hands of a music teacher. A letter from the teacher states: "I found it virtually unplayable, doubtless due to its eventful life." From here, it passed to its current, unnamed owner. "It's been in the same hands for the past 75 years," said Aldridge, whose auction house holds Titanic memorabilia sales in Devizes, southwest England, every year. "The family approached the auction house seven years ago." While the violin will not be auctioned immediately, Aldridge said it was worth at least a six figure sum. "It's an incredible human story," he said. "Wallace Hartley was one of the most important personalities in the story. His bravery was phenomenal. "In my opinion, it's one of the most iconic pieces of memorabilia from the 20th century." The violin will go on public display for the first time in Belfast, where the Titanic was built, at the end of this month. "We are in negotiations with several museums across the world," Aldridge added.